Director Sean Baker (Tangerine, Starlet, Prince of Broadway) helms this film co-written with Chris Bergoch that follows the exploits of Moonee (Brooklyn Prince), a precocious 6-year-old who lives with her unemployable mother, Halley (Bria Vinaite), in a low-rent motel located near Disney World. Set over the course of one summer, we watch Moonee and her friends Scooty (Christopher Rivera) and Jancey (Valeria Cotto) run wild around the touristy Florida strip, where they beg people for ice cream money, score free waffles from Scooty's mom Ashley (Mela Murder), and get themselves in trouble with their childish shenanigans. This is slice-of-life cinéma vérité filmmaking—think a colorful candy-coated version of Truffaut's The 400 Blows—where the plot is secondary to the film's realism. In fact, the closest the film has to a plot is Halley's ongoing struggle to make the rent—she buys knock-off designer perfumes and up-sells them to tourists, for instance—and to keep Florida's Department of Children and Families (DFC) from taking Moonee away. Bobby (Willem Dafoe) oversees the motel, called the Magic Castle, and he spends his days keeping its impoverished residents in line. It may be a low-rent motel, but Bobby takes its upkeep seriously. He also takes responsibility for its residents' children, watching over them with a fierce protectiveness, even though they make his job much harder. Bobby has deep sympathy for Moonee and Halley, and though Halley is a hot mess, he knows she cares deeply for her daughter. Aside from Dafoe and Caleb Landry Jones, who plays Bobby's son, Jack, who sometimes comes and helps at the motel, most of these actors are unknowns or first-timers. That only adds to the realism, and Baker elicits some amazing performances from them. The film simply feels like a glimpse into real life and depicts childhood with an honesty rarely seen in American cinema. It's both joyous and heartbreaking. This empathetic examination of American poverty doesn't depict characters that feel sorry for themselves. Halley is a defiant survivor, and Moonee is too young to know or care that they're poor. Instead, it humanizes its characters, offering viewers a peek into a segment of the population usually ignored (think Moonlight). HUNDRED ACRE WOOD Author A.A. Milne (Domhnall Gleeson) finds inspiration to write Winnie the Pooh thanks to his son, Christopher Robin (Will Tilston), in Goodbye Christopher Robin. A rare glimpse into the relationship between beloved children's author A. A. Milne (Domhnall Gleeson) and his son, Christopher Robin, whose toys inspired the magical world of Winnie the Pooh. Along with his mother, Daphne (Margot Robbie), and his nanny, Olive (Kelly Macdonald), Christopher Robin and his family are swept up in the international success of the books; the enchanting tales bringing hope and comfort to England after the First World War. But with the eyes of the world on Christopher Robin, what will the cost be to the family? Outlaw American pilot Peter Quill, er, I mean "Star-Lord" (Chris Pratt), creates an uneasy alliance with a collection of intergalactic misfits (Zoe Saldana, Dave Bautista, Vin Diesel, and Bradley Cooper) after they steal an orb on which Ronan (Lee Pace) wants to get his villainous hands. Imagine a sci-fi movie where every character is as awesome as Han Solo and you'll begin to understand why Guardians of the Galaxy is the most space fun you'll have since Star Wars parts IV through VI ... or at least since the Firefly series. Hollywood has finally figured out how to make use of co-writer and director James Gunn (Slither, Super) and his special brand of irreverent filmmaking. He fleshes-out five great characters: our hero Peter Quill with his tragic back story, with which the film opens; space buddies Rocket and Groot (voiced by Cooper and Diesel respectively), a genetically modified raccoon with a chip on his shoulder and a regenerative tree-like creature whose language skills start and end with the sentence "I am Groot" (did they really need Vin Diesel for this? ); Gamora (Saldana), a beautiful green assassin; and Drax (Bautista), a hulking literalist devoid of humor. Can this band of misfits keep Ronan from acquiring the orb with the power to destroy worlds? And more importantly, can they do it to a soundtrack of incredible classic pop hits like Blue Swede's "Hooked on a Feeling" and "O-O-H Child" by The Five Stairsteps? I'll say this about the film: Kids will definitely love it, but with its soundtrack and "retro-future" style, it really feels like a film made for people who grew up in the late-'70s and '80s. Its messages—that all different sorts of people can be friends, that being different is OK, and that by working together we can accomplish amazing things—are great messages for people of any age. Sure, it's pretty silly. I mean, come on, a tree and a raccoon? But Rocket and Groot, the two CGI characters, have a lot humanity despite the fact that there're composed of 1s and 0s. For Groot, it's more about his actions, but Rocket is an amazing character thanks to Cooper's quick talking voice work. He's really funny, as is Pratt as Peter. 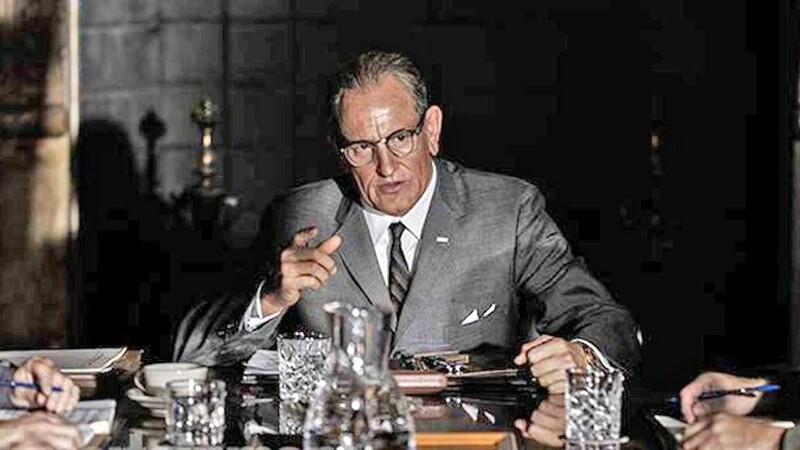 BECOMING PRESIDENT Thanks to an assassin's bullet, Lyndon Baines Johnson (Woody Harrelson) became president and pushed through the Civil Rights Act, in LBJ. Writers-directors Dorota Kobiela and Hugh Welchman helm this story about impressionist painter Vincent Van Gogh (Robert Gulaczyk), exploring his complicated life and mysterious death. Shot with live actors, the film was then transformed into animation. A team of 115 painters working in Van Gogh's style painted each of the film's 65,000 individual frames. The results are a spectacular and mesmerizing achievement! This film is a glory to behold, with paintings coming to life before your eyes. The story—written by the co-directors and Jacek Dehnel—takes place a couple years after Van Gogh's death. When an undelivered letter is discovered from Vincent Van Gogh to his brother Theo, Vincent's friend and frequent subject Postman Roulin (Chris O'Dowd) enlists his son Armand (Douglas Booth) to carry the letter to Paris and search for Theo, since the forwarded letter had already been returned "undeliverable." Armand sets out on the train, and soon his task turns into a mystery story as he tries to find Theo, and barring him, his widow or someone else who should appropriately receive what was perhaps Van Gogh's last epistle. 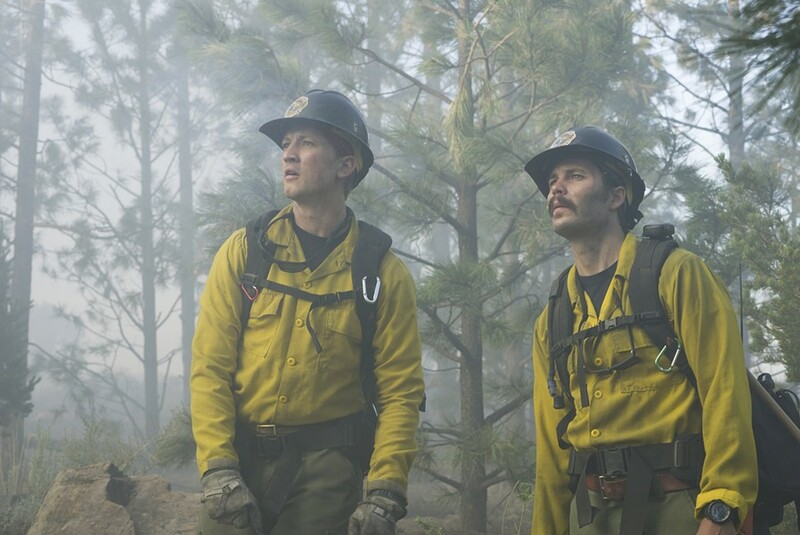 BROTHERHOOD Though at first at odds with one another, new crewmember Brendan McDonough (Miles Teller, left) bonds with veteran Christopher MacKenzie (Taylor Kitsch, right), in the wildfire drama Only the Brave. Joseph Kosinski (TRON: Legacy, Oblivion, the upcoming sequel Top Gun: Maverick) directs this true story of the Granite Mountain Hotshots, elite firefighters who risk everything to save their community from the raging Yarnell Hill Fire in June 2013. Talk about putting viewers through an emotional ringer! Only the Brave plays more like a war film, where the unbreakable bonds of brotherhood—bonds forged through impossibly difficult and dangerous work—are tested through hardship, the strain of personal lives, and a deep need to succeed. When we first meet the Granite Mountain crew stationed outside Prescott, Arizona, they're working a fire but designated as second tier firefighters. They stay in the back, dig fire lines, and clean up after the "Hotshots," firefighters at the highest certification level who are allowed to engage the fire directly. Hotshots are often helicopter into the danger. They're considered the best of the best. The Granite Mountain crew is headed by Eric Marsh (Josh Brolin), a veteran firefighter who desperately wants his crew to reach Hotshot certification, but they would be the first municipal crew in the nation to receive that elite status, which traditionally goes to state or federal firefighting units. Part of the film's tension is the crew's deep commitment to becoming Hotshots, aided in part by Duane Steinbrink (Jeff Bridges), the fire chief pushing to secure the crew an evaluation. There's also tension between their long and dangerous work hours and their significant others. The film especially delves into Marsh and his horse trainer wife Amanda's (Jennifer Connelly) relationship; their deeply held personal secrets are slowly revealed. Add in a new member of the Granite Mountain crew, a druggy burnout named Brendan McDonough (Miles Teller), who recently discovered he fathered a little girl and is looking for redemption, and it's easy to see why the film is so rife with emotionally explosive moments. Some of the guys on the crew, especially Christopher MacKenzie (Taylor Kitsch), are afraid McDonough will endanger the group. After this set-up, the film moves first to their evaluation and then to dramatic peak, as they join the fight against the Yarnell Hill Fire. The film is aided by excellent performances, especially Connelly and Brolin. Both of their characters are survivors who have turned their lives around, and while they both were committed to being childless, as Amanda has gotten older, she wants to revisit that while Eric is still uncertain. It makes for some incendiary moments, and it doesn't help that Eric's emotions are often on edge. In fact, the acting all around is terrific, with Teller—who I don't always like—offering a raw performance as the drug addict who's finally got something to live for. From what I know of wildfire crews, this film offers a realistic look at the training, the camaraderie, and the firefighting techniques used, and my hat's off to director Kosinski for amassing a technical team to create some really believable wildfire special effects. There are some amazing moments, such as a helicopter shot of a running elk streaking away from the fire. Ash Ketchum from Pallet Town turns 10 and dreams of becoming a Pokémon trainer. GOD OF THUNDER! 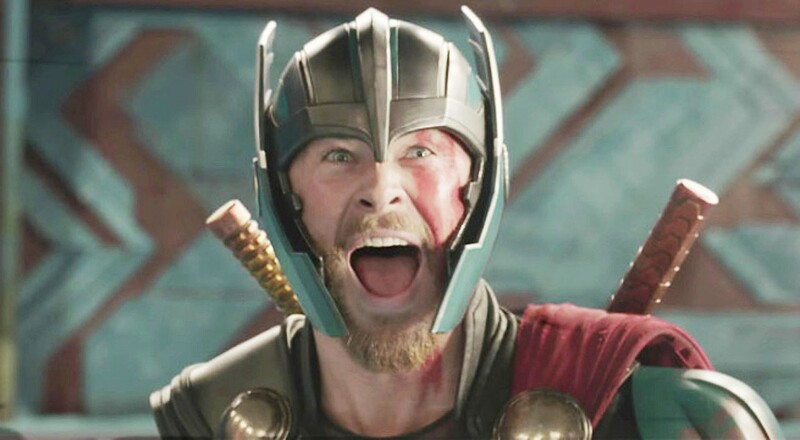 After Thor (Chris Hemsworth) loses his hammer and is imprisoned on the other side of the universe, he must fight his way back to Asgard and stop its destruction, in Thor: Ragnarok.